I have had a couple of opportunities lately to get my creative on. 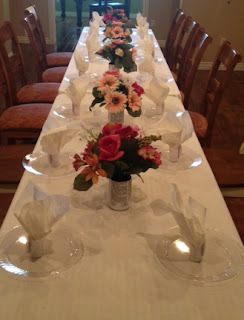 One was for a book club brunch my daughter was hosting for a group from our church. The challenge was to pull from my resources to come up with a decorating idea for her tables. Vases made from tin cans that I covered in book pages. 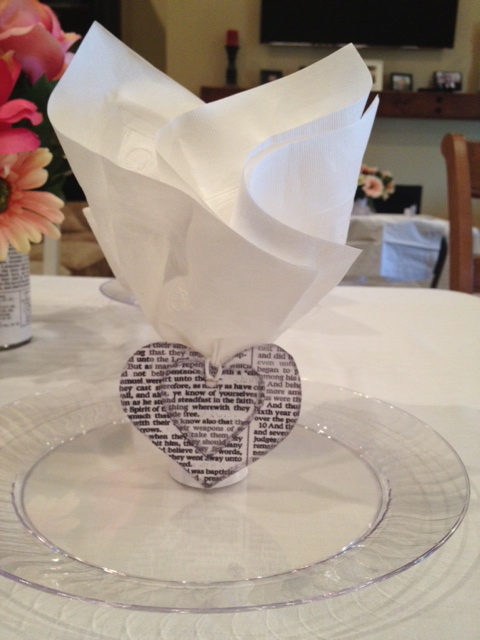 And, napkin rings made completely out of card stock! The silk flowers were from my resources too. It turned out very pretty with no cost! create for the very next day. Again, wanting to make it from the resources I had on hand. The event was vintage so that was the direction I headed. is what I came up with times two! tablescape and refreshments for the actual event. I really do love getting my creative on! Your love for doing creative things sure shines through -- as does your talent. Nicely done! You forgot to mention that you created the beautiful tablescape, centerpieces, and napkin rings with less than a day's notice! Thanks so much! !